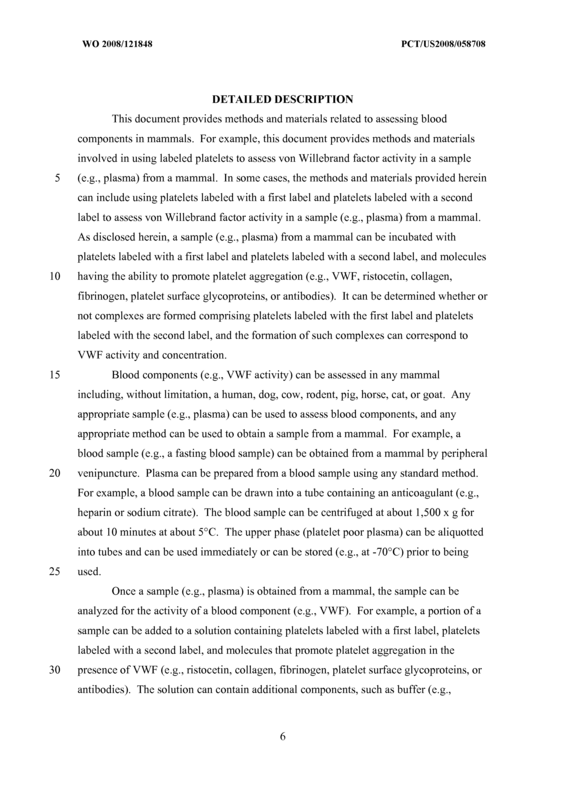 This document relates to methods and materials involved in assessing blood components (e.g., assessing von Willebrand factor activity or platelet activity) in mammals. 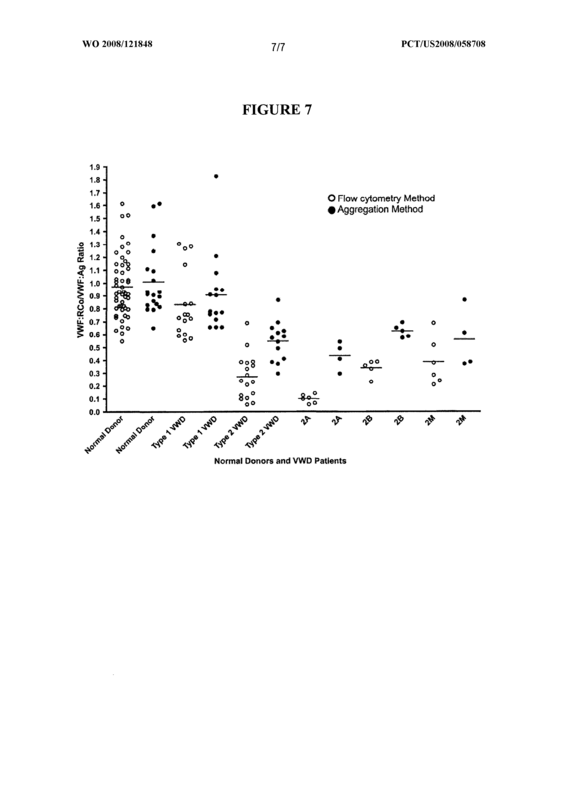 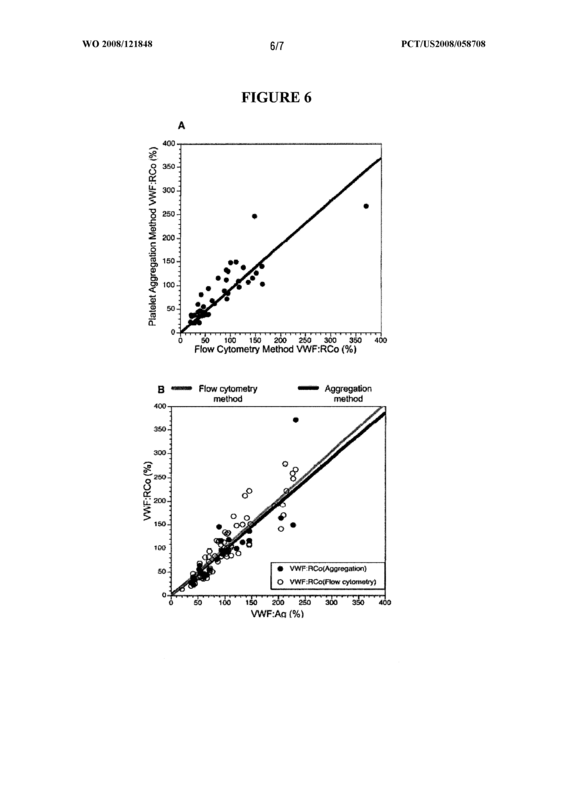 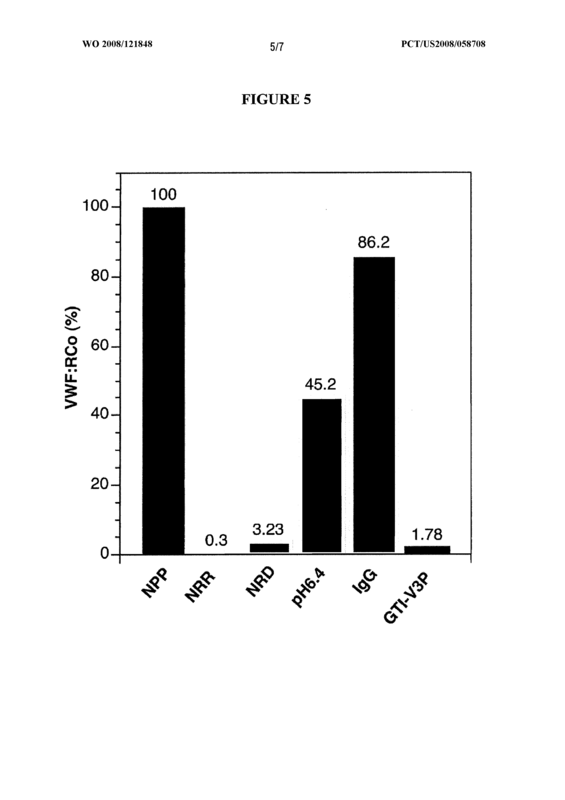 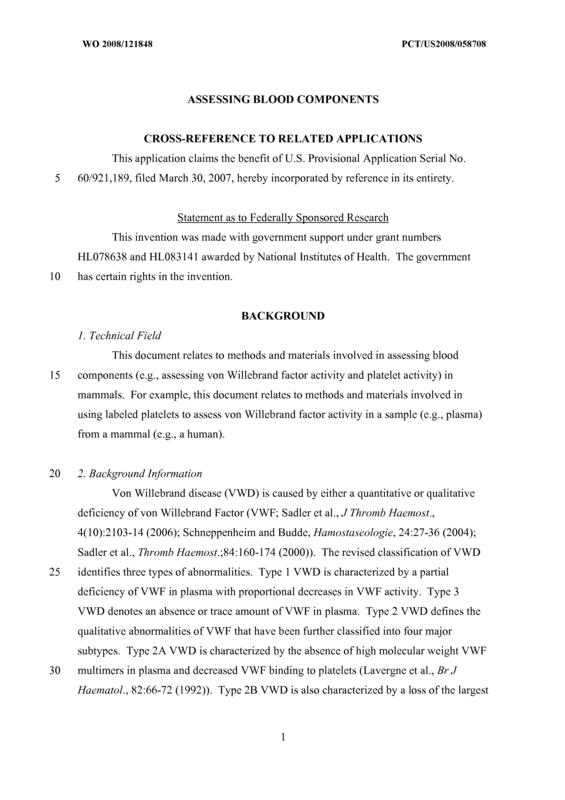 For example, methods and materials involved in using labeled platelets to assess von Willebrand factor activity in a sample (e.g., plasma) from a mammal (e.g., a human) are provided. 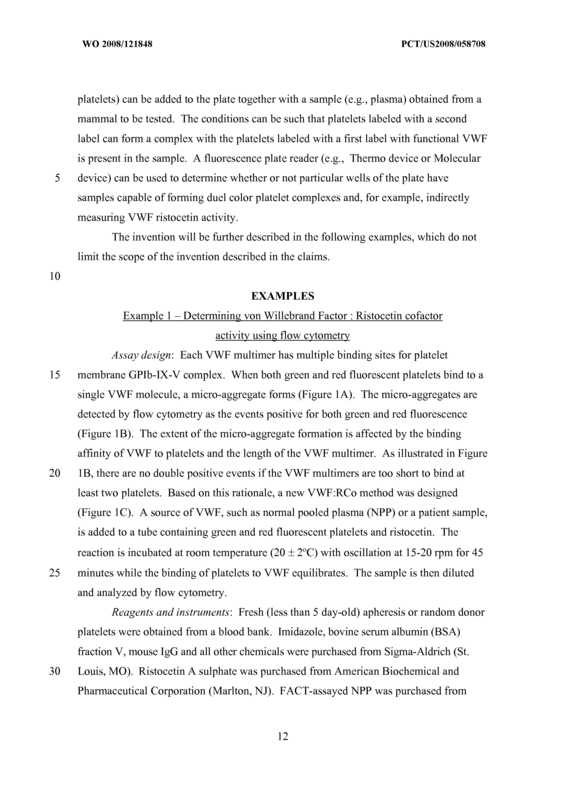 (b) determining whether or not a complex is formed comprising a platelet labeled with said first label and a platelet labeled with said second label, wherein formation of said complex corresponds to said von Willebrand factor activity. 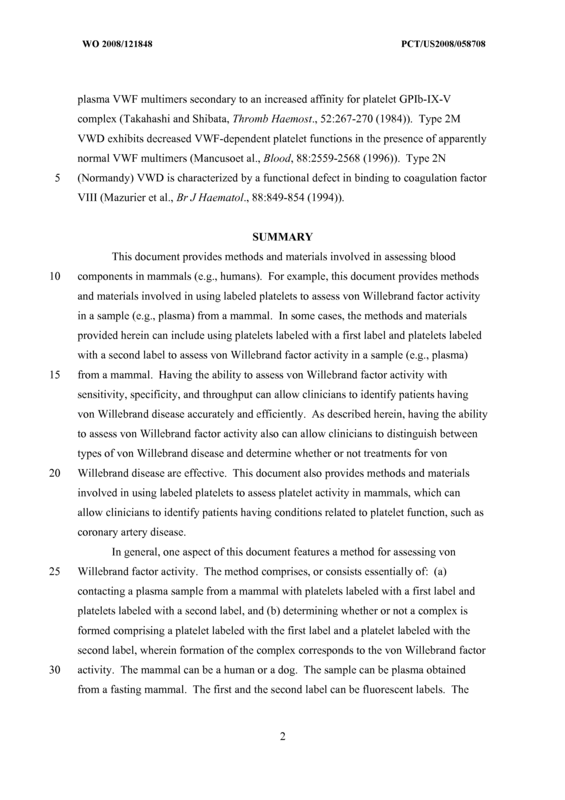 The method of claim 1 , wherein said mammal is a human or a dog. 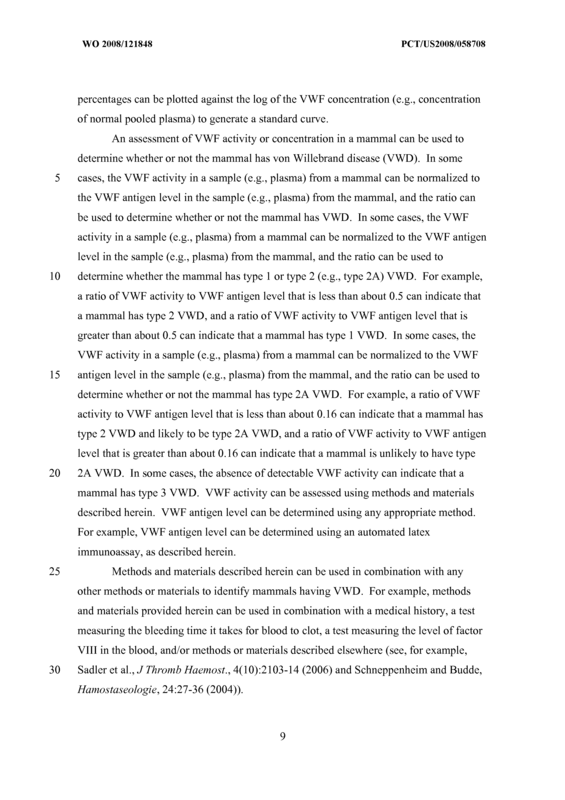 The method of claim 1, wherein said sample is plasma obtained from a fasting mammal. 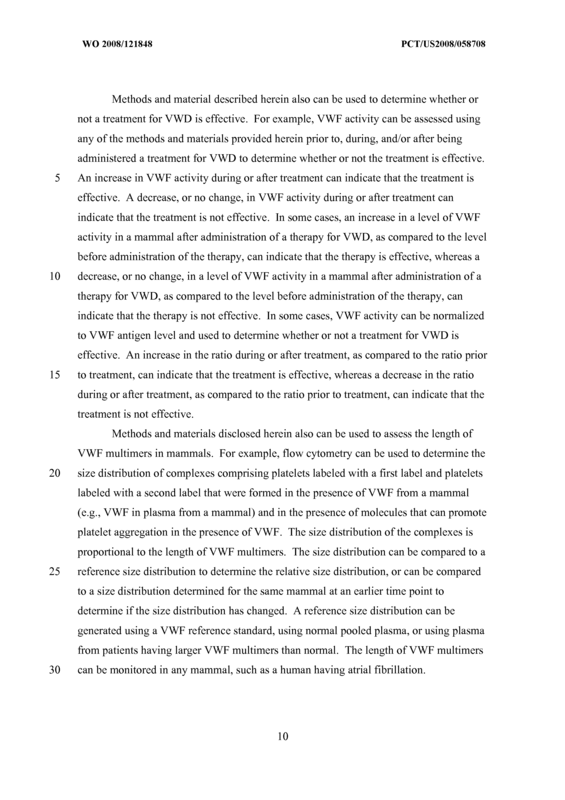 The method of claim 1, wherein said first and said second label are fluorescent labels. 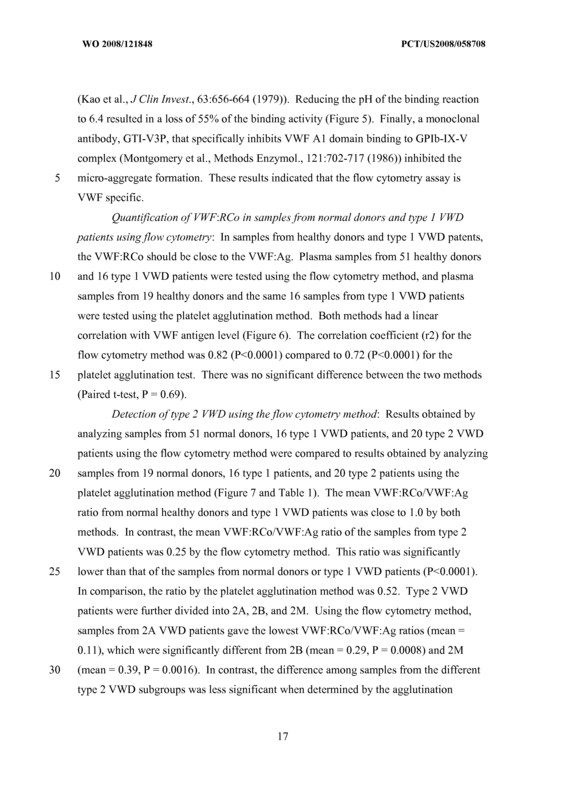 The method of claim 1, wherein said determining step comprises using flow cytometry. 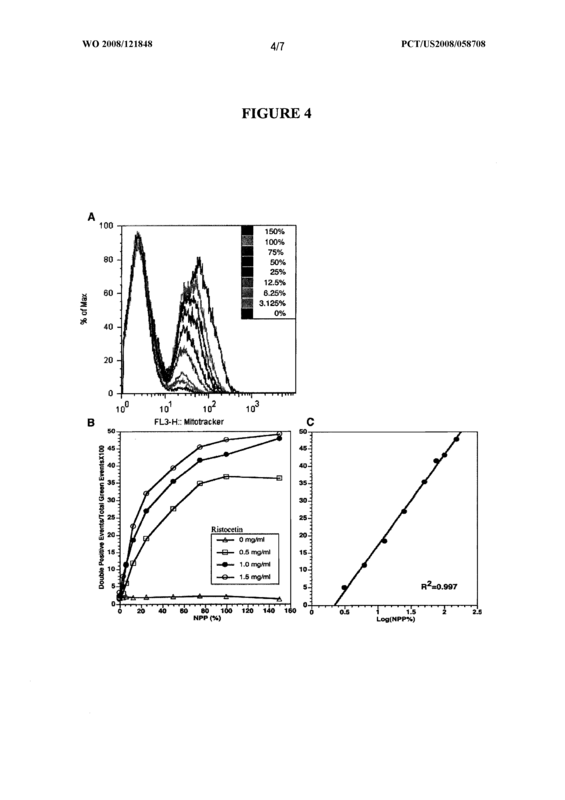 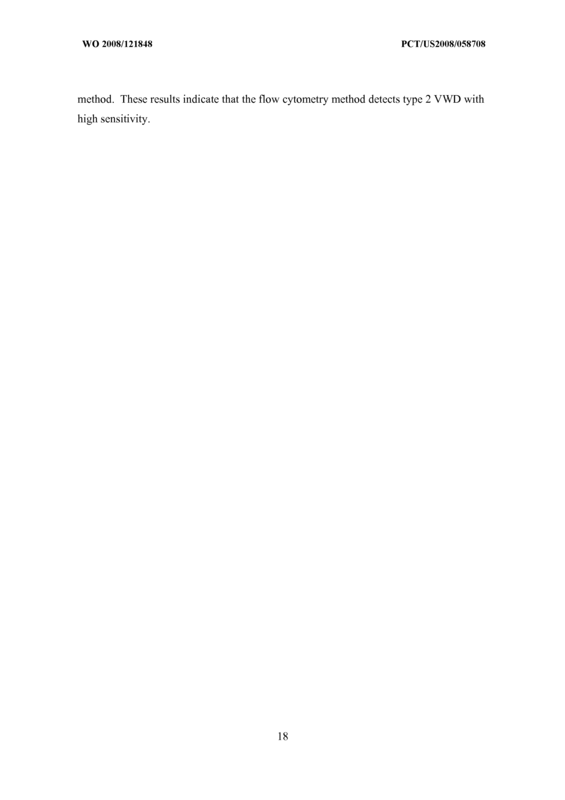 The method of claim 1, wherein said contacting step is performed in the presence of ristocetin. 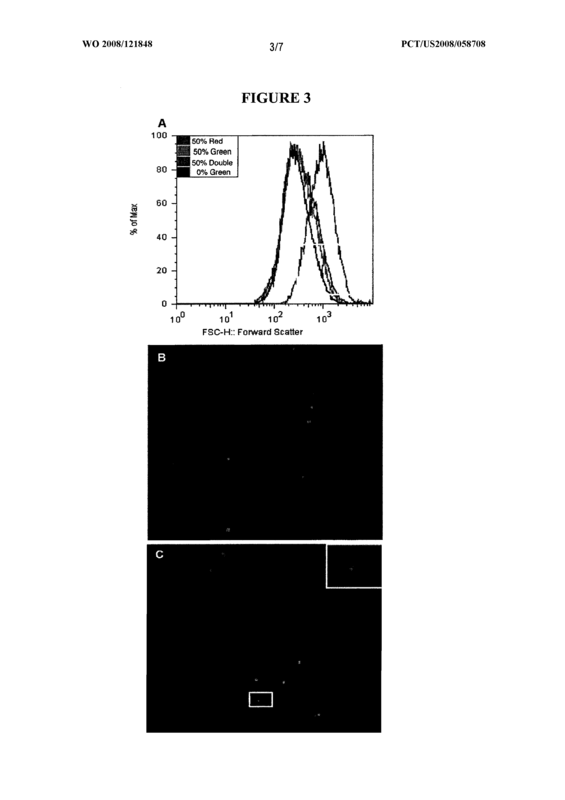 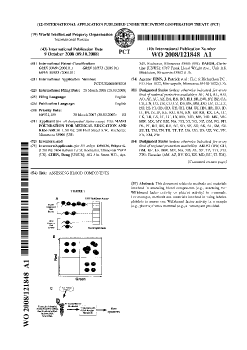 A method for assessing platelet activity in a mammal, said method comprising (a) contacting collagen with platelets from said mammal labeled with a first label and platelets from said mammal labeled with a second label, and (b) determining whether or not a complex is formed comprising a platelet labeled with said first label and a platelet labeled with said second label, wherein the formation of said complex corresponds to said platelet activity. 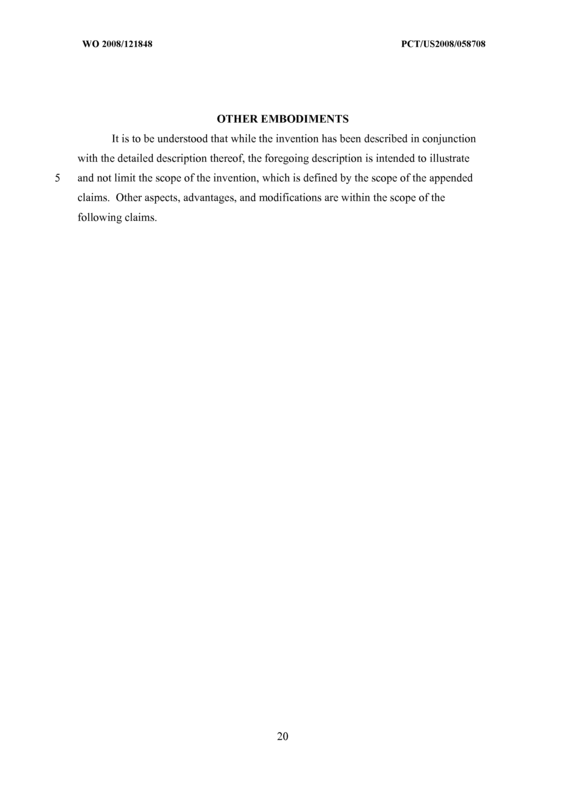 The method of claim 6, wherein said mammal is a human or a dog. 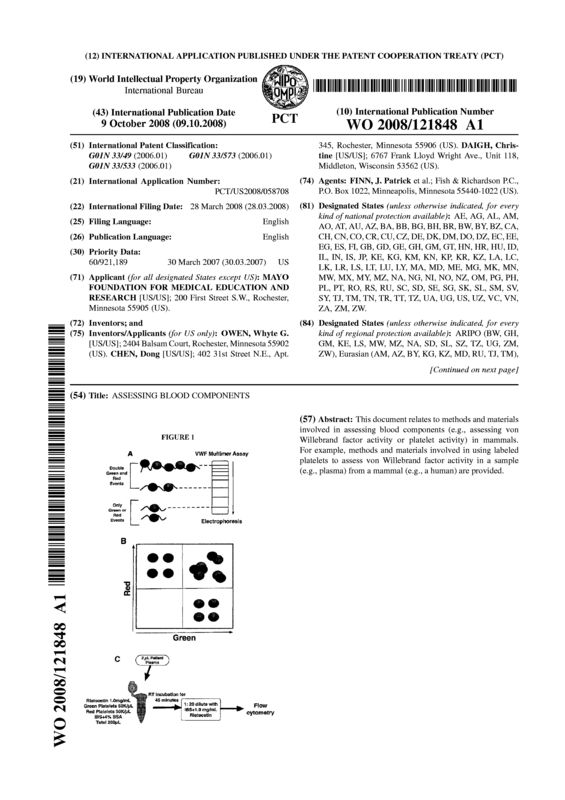 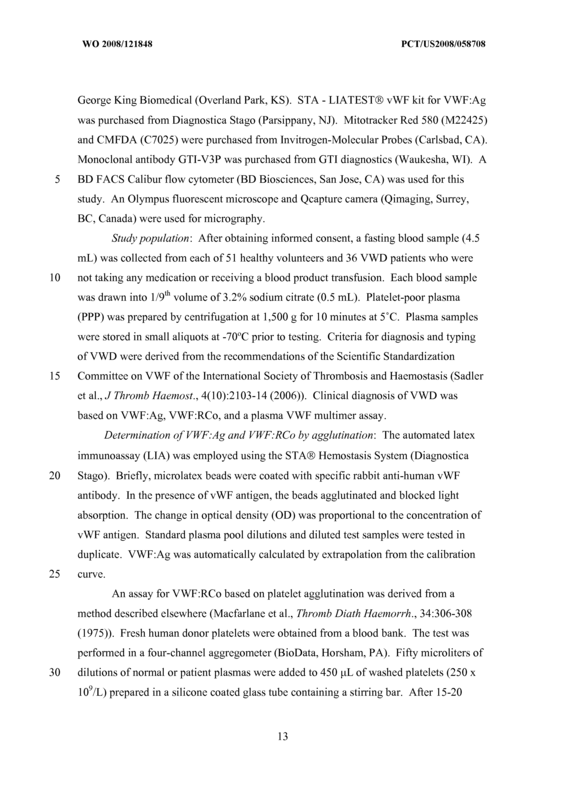 The method of claim 6, wherein said platelets are obtained from a fasting mammal. 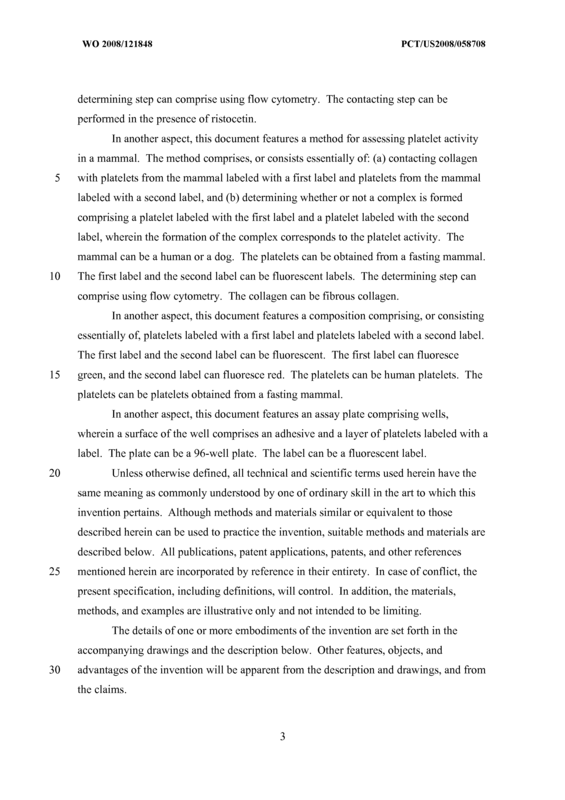 The method of claim 6, wherein said first label and said second label are fluorescent labels. 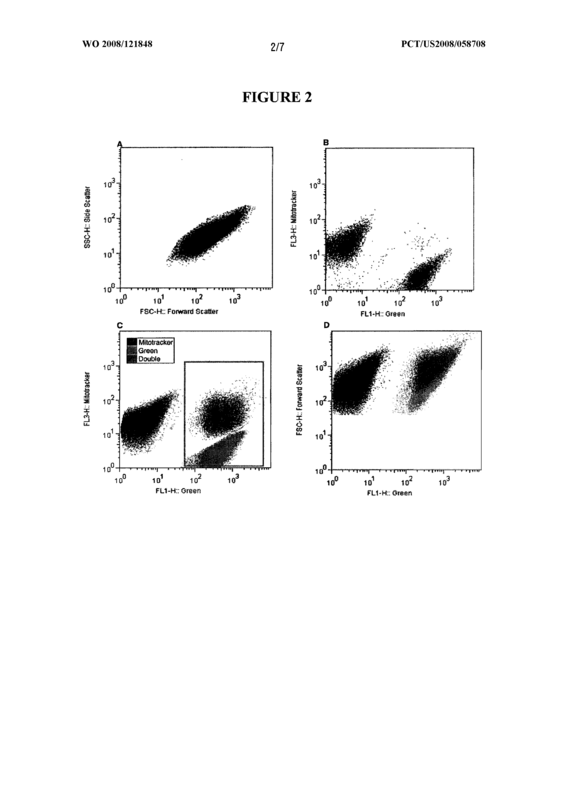 The method of claim 6, wherein said determining step comprises using flow cytometry. 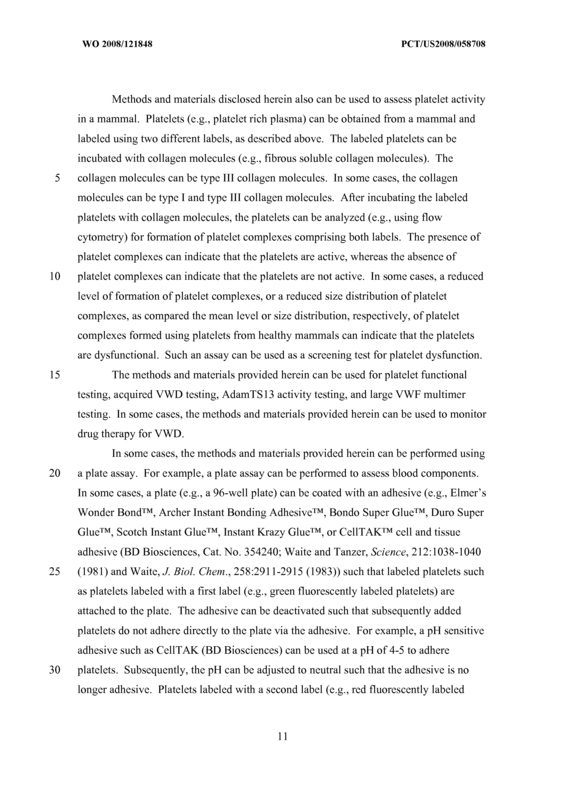 The method of claim 6, wherein said collagen is fibrous collagen. 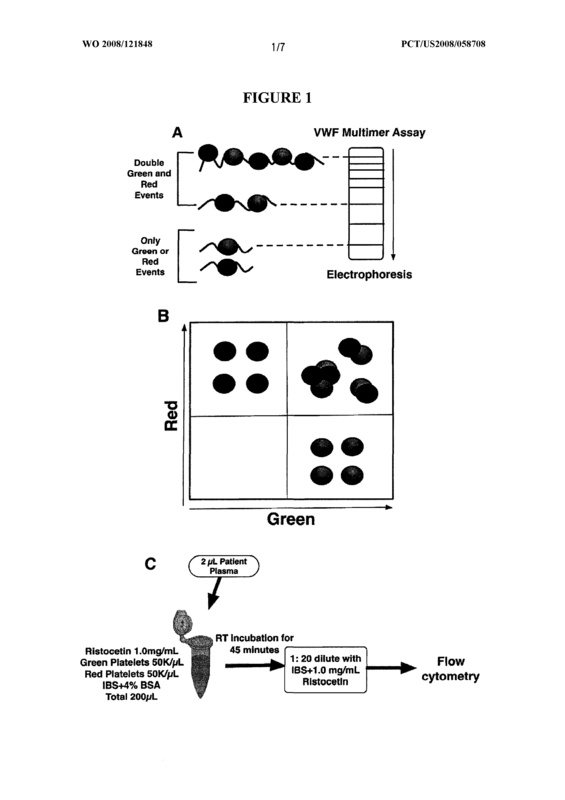 A composition comprising platelets labeled with a first label and platelets labeled with a second label. 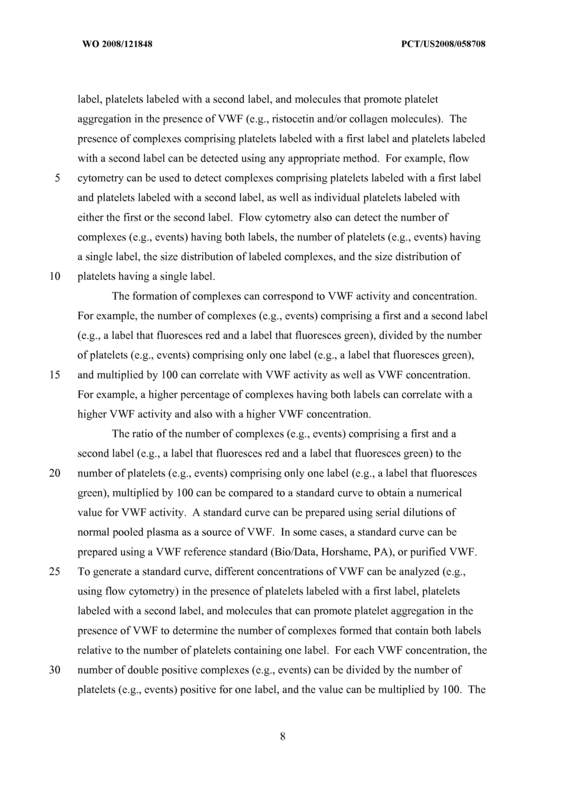 The composition of claim 13, wherein said first label and said second label are fluorescent. 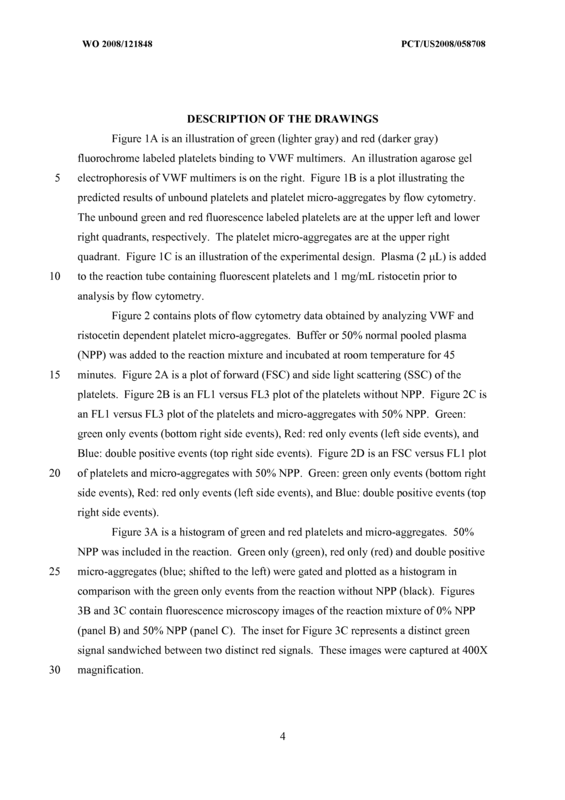 The composition of claim 14, wherein said first label fluoresces green and said second label fluoresces red. 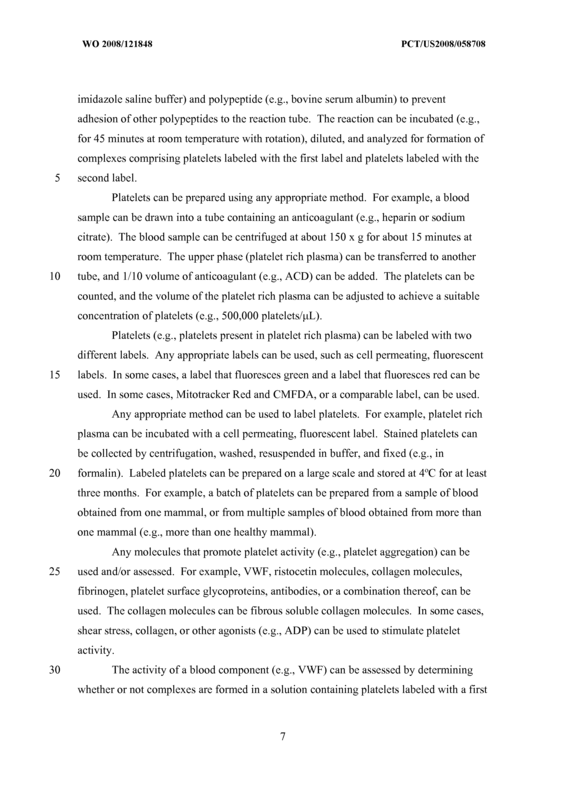 The composition of claim 13, wherein said platelets are human platelets. 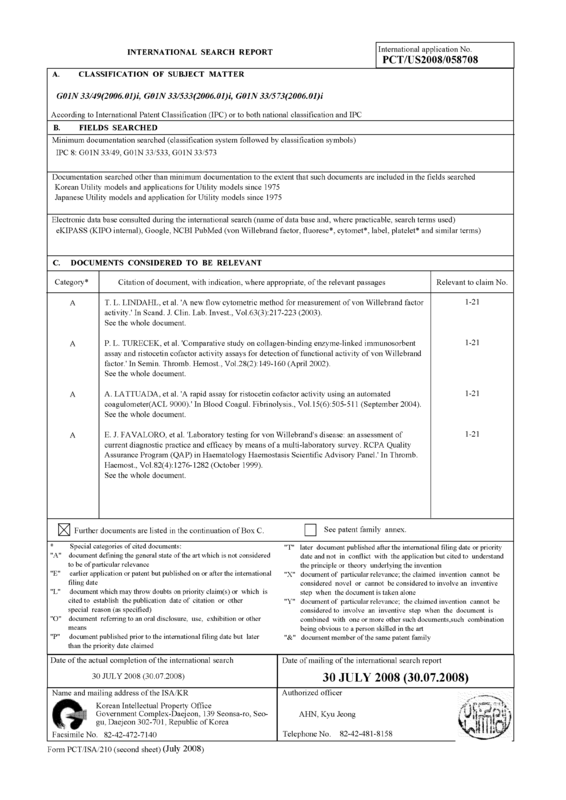 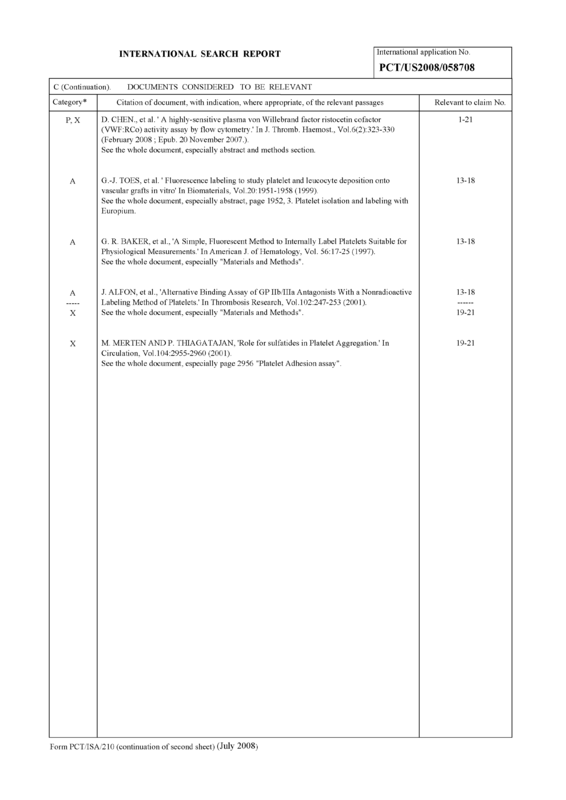 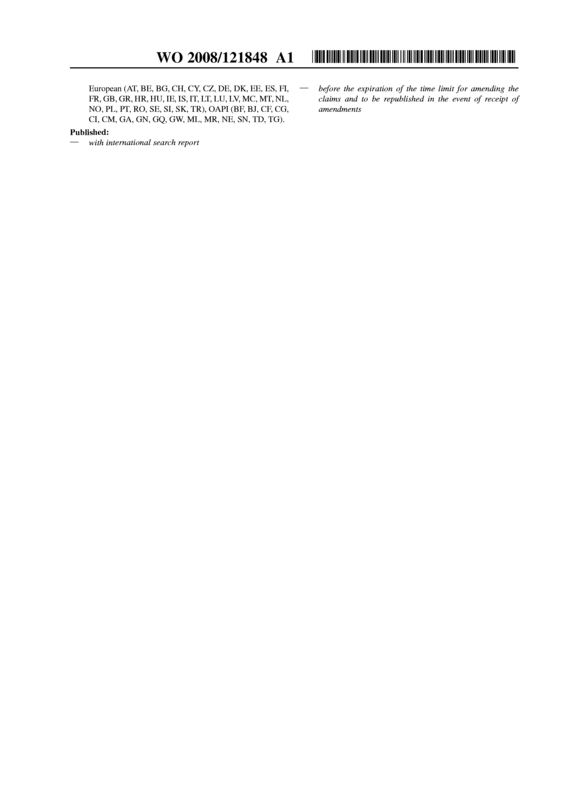 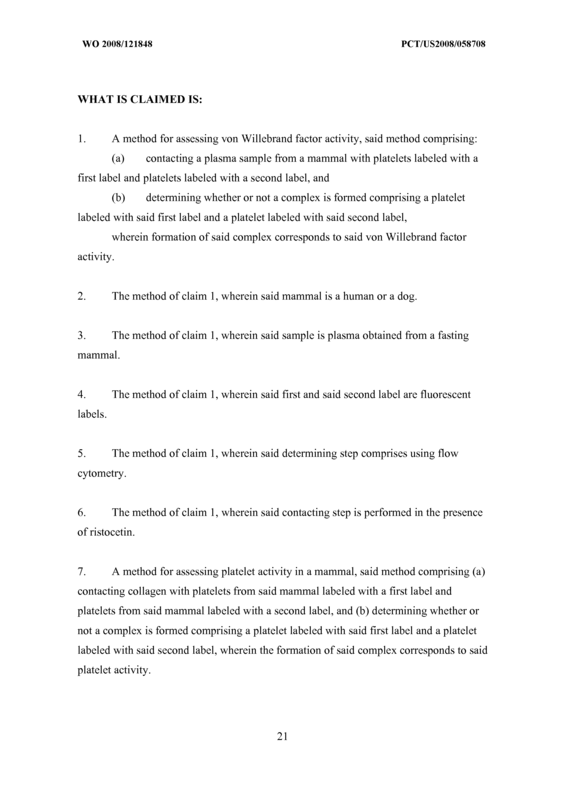 The composition of claim 13, wherein composition comprises ristocetin. 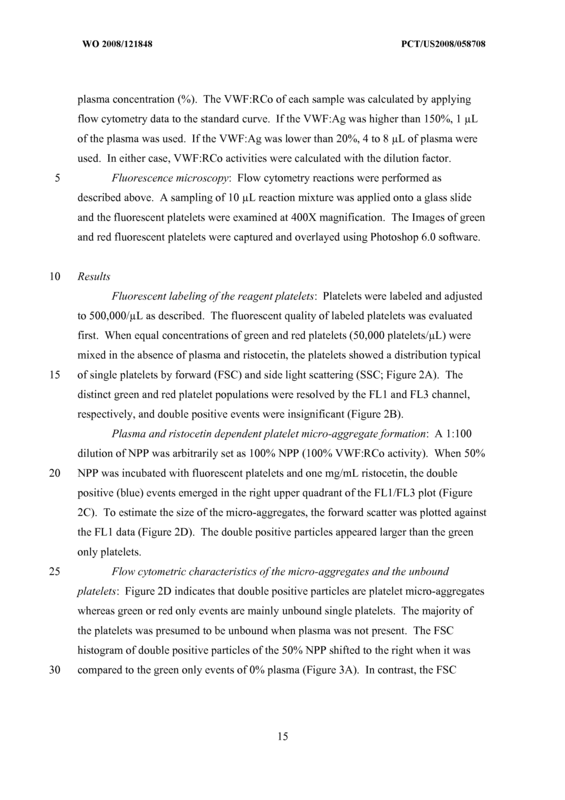 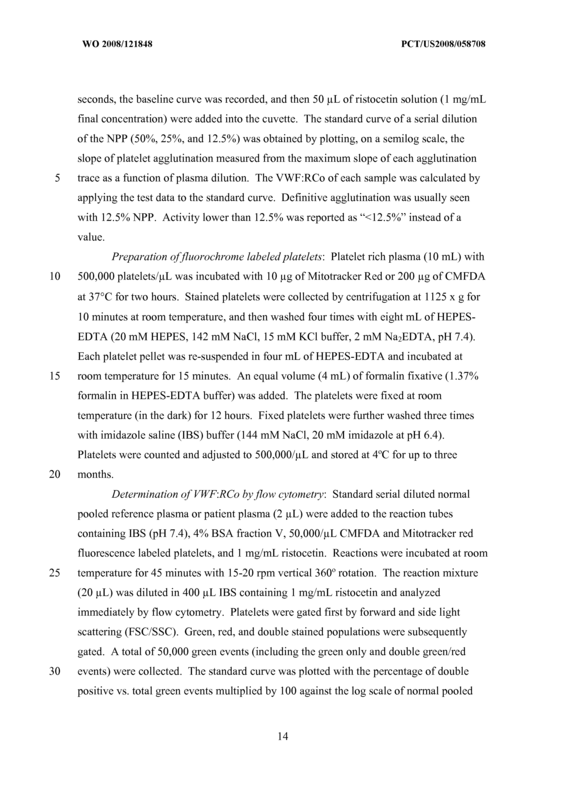 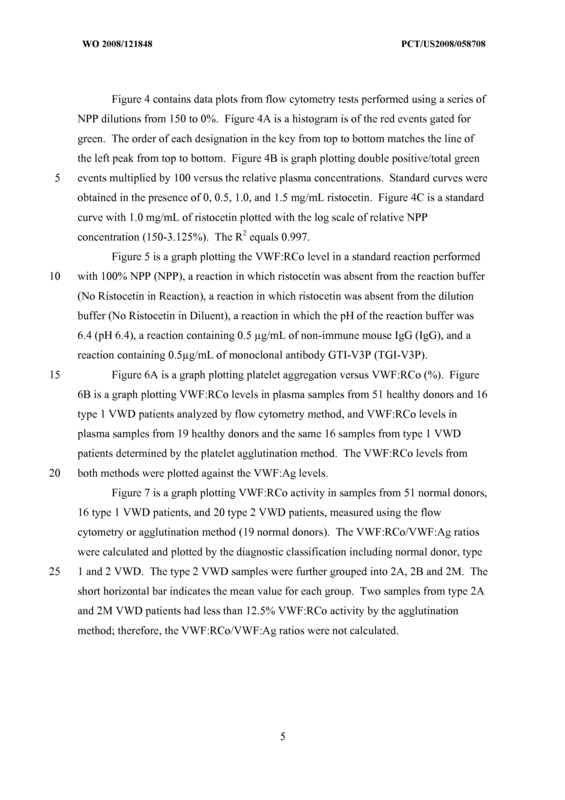 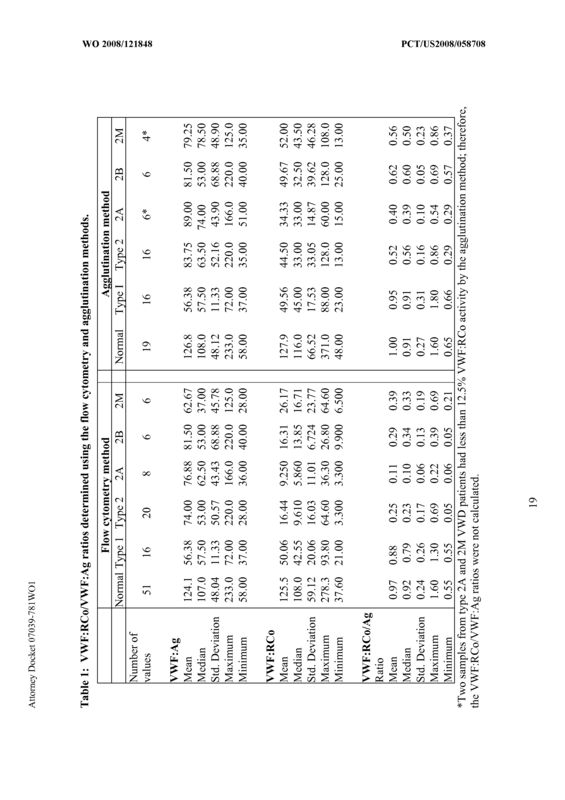 The composition of claim 13, wherein said platelets are platelets obtained from a fasting mammal. 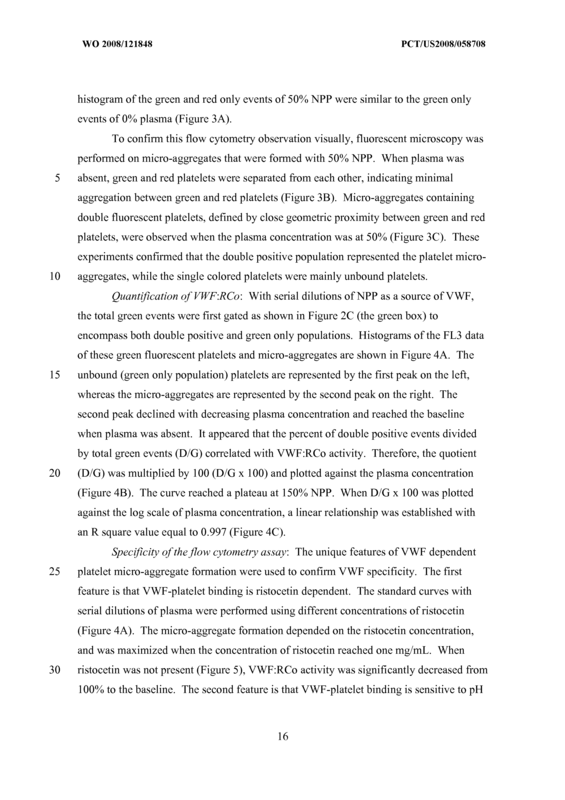 An assay plate comprising wells, wherein a surface of said well comprises an adhesive and a layer of platelets labeled with a label. 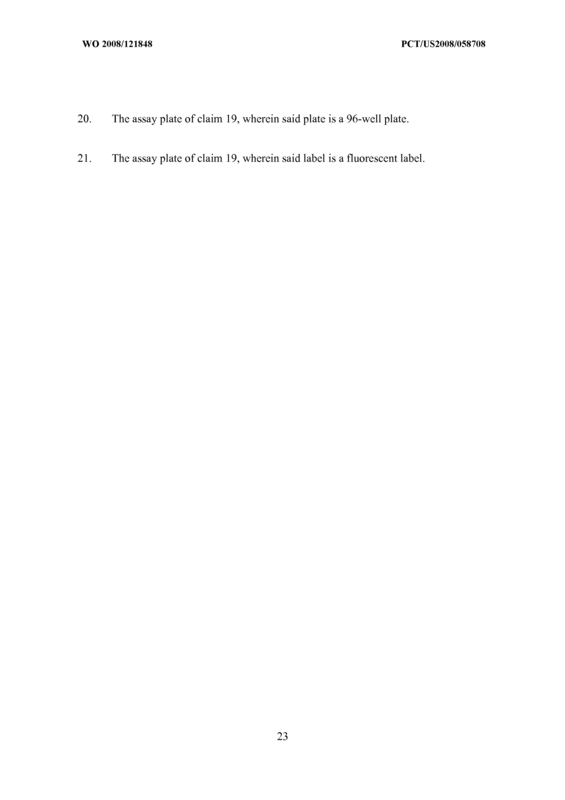 The assay plate of claim 19, wherein said plate is a 96-well plate. 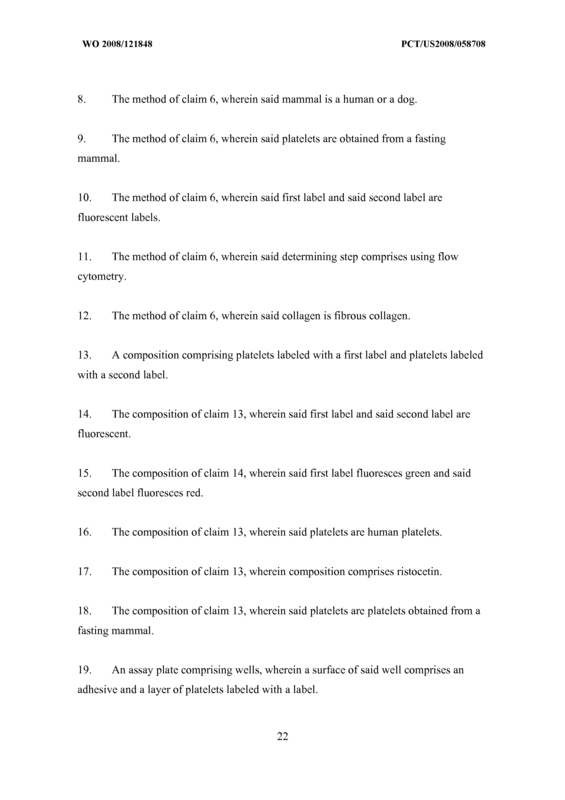 The assay plate of claim 19, wherein said label is a fluorescent label.